On Monday 11th November, Bowker Vale Primary School held a commemorative tree planting in a ceremony on the Top Meadow to remember local people who suffered or died as a result of war. A minutes silence was observed at 11am with The Last Post played on bugles by Rob Fullen and Dave Lynch of the 434th Manchester Scout Group. Some of the pupils read out poems they had written specially for this ceremony and the flag of the Royal Marines was lowered by Stan Hocking, Chairman of the Royal Marines Association. To read one of the poems, click here to visit the Bowker Vale Primary school website. 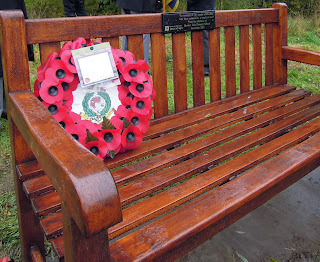 on a new bench presented by the children of Bowker Vale School by Corporal Glyn Forshaw and Marine Bradshaw from 40 Commando Royal Marines, in remembrance of Marine Jonathan David Thomas Crookes, who died in Afghanistan in July 2010. Two trees were then planted close to the bench, at the north end of the Top Meadow. The event was organised by Daisy Horsley of English Heritage as part of the Heritage Schools Programme. The Bowker Vale School project was led by teacher Emily Aaron and Head Rachel Jacques. Councillors Anna Trotman, Harry Lyons and Shelley Lanchbury attended the ceremony together with representatives from the Royal Marines Association.